President Donald Trump has issued a directive tasking the Pentagon with creating plans for standing up the U.S. Space Force as a branch of the U.S. Air Force. 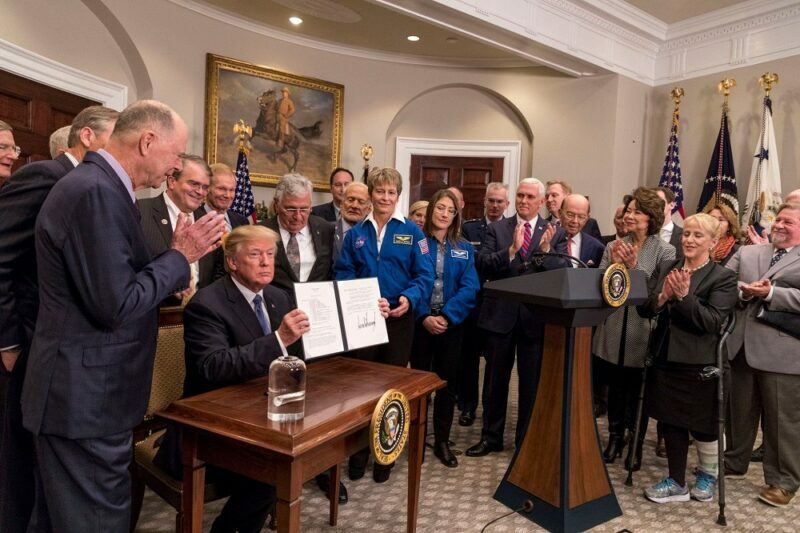 Calling the move “an important step toward a future military department for space,” Trump said the U.S. Space Force would help “deter aggression” from adversaries and protect U.S. interests in space. The decision to situate the new branch within the Air Force — instead of creating a separate branch entirely — makes the move more likely to garner the necessary approval from Congress, Defense Department watchers say. Trump’s Feb. 19 directive charges the defense secretary with coming up with the specific legislative proposal for creating the Space Force. “Although United States space systems have historically maintained a technological advantage over those of our potential adversaries, those potential adversaries are now advancing their space capabilities and actively developing ways to deny our use of space in a crisis or conflict,” Trump said in the directive, laying out the necessity for the new branch. As detailed in the White House plan, the new branch will consolidate existing forces and authorities for military space activities, including assuming responsibility for all major military space acquisition programs. The new branch will also be responsible for creating new career tracks for military and civilian space personnel across all relevant specialties, including operations, intelligence, engineering, science, acquisition and cybersecurity. The Space Force would get its own proposed budget in the fiscal 2010 White House budget, per Trump’s plans. Establishing the new branch would also trigger a new leadership position. The plan includes creating a civilian undersecretary of the Air Force for Space — a new presidential appointee position requiring Senate confirmation. It would also create a chief of staff of the Space Force, who will be a senior military officer in the grade of general or admiral, and who shall serve as a member of the Joint Chiefs of Staff. In addition, the plans call for the establishment of a U.S. Space Command, which will have all the responsibilities of a unified combatant command in addition to other space-related responsibilities currently assigned to the U.S. Strategic Command. The new branch will collaborate with the intelligence community “in order to increase unity of effort and the effectiveness of space operations,” according to the directive.